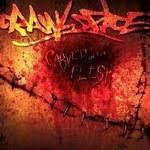 [official info] Crawlspace are back, more technical and skilled than ever with a bomb of an album aptly titled 'Carved Into Flesh'. High quality recording and an excellent mastering job by Nicolas Declève guarantee a album with 7 new tracks plus 2 old tracks off the MCD reworked into brutality! Crawlspace needs no introduction. The gang who introduced Limburg Tough Guy Fury have been around for a long time. After a devastating MCD on the now-defunct RPP Productions and a split with their bros in FULL COURT PRESS the band signed with Good Life's Subsidiary label Final Beatdown Records and released their legendary full length debut 'Enter The Realm of Chaos' CD/LP.